Outstanding primary and secondary schools, fantastic transport links into both central London and out to Heathrow airport, popular high streets, world-famous parks and gardens, historic landmarks and incredible river views mean thousands of families opt to live on this section of the river. For those looking for a more laid-back lifestyle with all the perks of easy access into the West End and the City, locations such as Richmond, Kew and Chiswick are ideal. 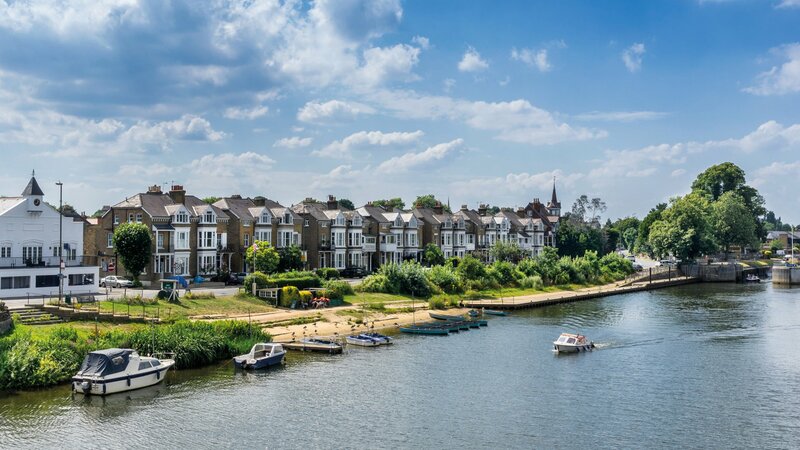 Scenic riverside settings act as the perfect backdrop to new developments and older, more traditional properties found on this side of London. We regularly have a variety of riverside property for sale or to let, including flats and apartments in a number of award-winning developments. View a selection of riverside developments in west London. With Waterview offices in Fulham, Putney, Richmond, Kew, Chiswick and Hammersmith, we truly have this section of the River Thames covered. Richmond claims the oldest surviving Thames bridge in London, dating from 1774. Richmond Green is home to one of London’s finest early Georgian terraces, Maids of Honour Row, dating from 1724 having been built for the maids of honour of George II’s wife, Caroline. With acres of green space including Royal Richmond Park and Old Deer Park, Richmond is one of London's most attractive towns. The view of the River Thames from Richmond Hill is protected by an Act of Parliament and was immortalised in paintings by JMW Turner. Families and young professionals come to Richmond for the Georgian and Victorian architecture, excellent schools and great transport into central London. On a summer’s day Richmond riverside is heaving with people of all ages enjoying one of the prettiest views of the Thames. From Kew Bridge the Thames flows by a collection of beautiful 18th Century houses and pubs known as Strand on the Green. The Royal Botanic Gardens at Kew, London's largest World Heritage site, offer unique landscapes, iconic architecture and the largest and most diverse offering of living plants in the world. Chiswick is packed with green spaces, tree-lined streets and beautiful architecture. A selection of high performing schools and a growing business park make Chiswick home to a blend of young families and professionals. The High Road is bursting with cafes and restaurants and, with the Fullers Brewery and the Sipsmith Gin Distillery both local, you are never far from cold drink in a great pub by the river. Hammersmith is one of London's key commercial and business areas, with great transport links both out to Heathrow Airport and into central London, and a variety of residential properties, from period houses to newly built developments. Nestled between Fulham and Chiswick, Hammersmith is one of the fastest-changing areas in recent years and caters to both families and young professionals with a good mix of new restaurants and a traditional weekly farmers market. With the River Thames on your doorstep, Hammersmith riverside is an ideal place for an evening stroll, cycle or Sunday lunch. Nestled in a bend of the River Thames, with affluent Chelsea to the north, Fulham is one of London's popular residential locations, with the added bonus of plenty of lovely riverside pubs. Fulham has a strong village feel, with its mixture of Victorian and Edwardian architecture. A well established and thriving area for families and young professionals, locals enjoy the wide selection of boutiques, restaurants, shops and bars and can often be found strolling through Bishop’s Park, Hurlingham Park, and South Park. Putney Bridge was built in 1886 and is known for having a church at both ends - All Saints in Fulham and St Mary’s in Putney. Putney’s vibrant town centre is a popular residential area. Surrounded by the Thames and Putney Heath, locals can be found strolling through the parks and running or cycling along the towpaths of the Thames. Putney’s numerous riverside pubs and bars make it a favourite among those who enjoy watching the annual Boat Race with a pint of Fullers in hand.